We began this Lent Madness journey over five weeks ago on “Ash Thursday.” We started with 32 saints and have now whittled the field down to two: Mary Magdalene and Emma of Hawaii (who staged a wild comeback against Dietrich Bonhoeffer yesterday). We literally couldn’t have done this without our “Celebrity Bloggers” to whom we offer sincere gratitude. Dr. Meredith Gould, the Rev. Penny Nash, the Rev. Bosco Peters, Canon Heidi Shott, the Rev. (Bracket Czar) Adam Thomas, the Rev. Laura Toepfer, the Rev. Neil Alan Willard, and the Rev. Chris Yaw — you guys rock! Oh, wait, there’s one more thing before we set our face toward the Triduum. Cast your vote for either Mary Magdalen or Emma of Hawaii — the 2012 Golden Halo hangs in the balance! The polls will be open for 24 hours and the winner will be announced at 8:00 am Eastern time on Maundy Thursday. Excerpts from a lament by the Pacific Commercial Advertiser upon Queen Emma’s death in 1885. For their loved Ema-lani is no more. No more she gives the sick and poor relief. The throne and hut unite their tears to blend. And England’s Queen will mourn a sister gone..
She is but veiled from our mortal eyes. And so we leave her sleeping sweet in God. NOTE: At 4:13 p.m. EDT, the Supreme Executive Committee removed 120 votes for Emma, based on heavy repeating voting from a single location. We are glad you are enthused about your saints, but please vote only once! 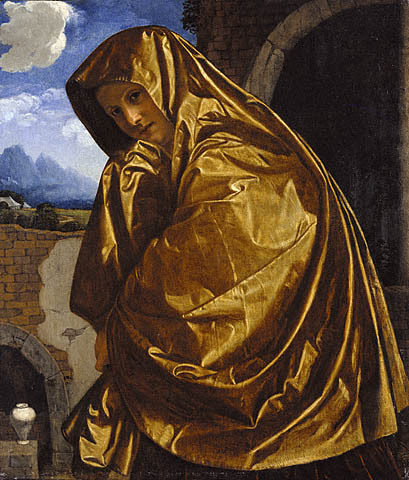 145 Comments to "For the Golden Halo: Mary Magdalene vs. Emma of Hawaii"
Today’s post about the two was good. ‘Nuff said. It’s the Magdalen. The Magdalen has been my University of Kentucky since the very beginning. How often those words have inspired me, “I have seen the Lord”; The fervent hope of every Christian. All of the Saints we have learned about have seen the Lord in their own way and time in the faces of those they served. But, our dear Mary was the first. Like us she went to the tomb in sorrow and came away with joy! And it transformed her life. In a time when women were discounted, she was a faitful witness. Amen! I am sure to be much like Mary, initially feeling the sadness throughout this Holy Week, then exceeding JOY at the reminder that Easter’s message is as simple as Mary’s declaration: Jesus is RISEN, indeed! Tim and Scott. I am confused. There is a comment at the end of the Bonhoeffer vs Emma posting that indicates that Bonhoeffer won over Emma (copied below). Please explain. 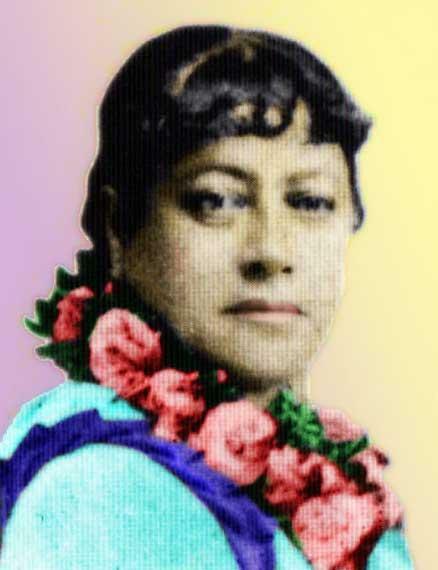 “NOTE: At 12:14 a.m. EDT, the Supreme Executive Committee removed 70 votes from Emma of Hawaii. We noticed that there were 20 votes in close succession from a residence in Hawaii and 50 from a residence in Arizona. While we commend your enthusiasm, we do not commend repeat voting. We’re watching this one carefully, so don’t vote more than once, please. Some people voted multiple times in Dietrich vs. Emma. We subtracted those votes. The indicated result is correct. Emma beat Dietrich by the results which are shown. If your results look like mine, the name of the loser – nope can’t call him that — non-winner Bonhoeffer is bolded in the final results. That’s happened in other contests and tricked me before as well, so that may be why he had the temporary illusion of victory in your eyes. Compared to that decision the rest of my Holy Week responsibilities will be easy. So glad that Emma made that wild comeback. And she could do so again, perhaps. But I’ve been with Mary all the way, and happily cast my vote for the Magdalene! Not sure what you’re seeing, Charita. Emma 51%, Bonhoeffer 49%. Exceedingly close but the victory is Emma’s. Sorry. I do not know what I saw earlier either. I just revisited, including the results pasted in my earlier comment, and see now in the results that Emma won. Hmmmmm. My apologies for any confusion I caused. Perfect summary of today’s decision! 🙂 I voted for Mary, but I feel the pain of that pithy poem. Thank you to all who worked so hard to inspire us and bring us a good laugh. May your tribe increase. Mary Magdalene was blessed with much love (and such Love), and she had physical propinquity as well as a spiritual bond with her Savior. Emma also had much Love, but her propinquity to Christ was over and through many generations. Since I have voted for the underdog throughout these 32 days, I shall continue–loving both. I too voted for the Mag, but I always thought that the Ascension gave us all equal propinquity regardless of generations. Mary M. gets my final vote. Thanks, guys, for an entertaining and enlightening Lenten diversion! I really thought I would vote for Mary of Magdala, but the words Jesus said to Thomas after the resurrection came to me after reading that wonderful tribute to Emma about the blessedness of those who have not seen, yet believe. Emma got my vote. Queen Emma Kalanikaumakaamano Kaleleonālani Naʻea Rooke has got my vote for this!!! Mary all the way!! Thank you all for a wonderful experience this Lenten season. It was wonderful, and I am already looking forward to next year!! I had MM as my final pick (going against Cramner). I voted for her. Since the first round I read a book on her and have come to a new understanding of her and her role in Christianity. While this certainly a fun Lenten practice, it deepened in faith in ways I did not expect. Thank you SEC… And everyone who contributed comments daily. I have now voted in every contest. Where’s my tattoo? I have to make an apppoinent aty local tatoo parlor. I was promised a tatoo! when and where was a promise of a tatoo? Sharon, I’m not certain where, when, or under what circumstances a tattoo was promised but, as a proud wearer of body art, I can pretty much guarantee you that tat’s can be habit forming. so somebody should deliver a tattoo to this lady…..ink refusal can get pretty ugly….. Casting a final vote…in all this madness…for the woman of Magdala who wept in the garden in grief, and was rewarded for her faithfulness with a visitation and peace and joy of the first Easter. I have so enjoyed this diversion/education/entertainment. It has been enlightening (if a little bit frightening) and despite somelingering reservations as to the authenticity of the voting…I’m enjoyed the comments and information…and the fun. That’s what it was all about. 😉 blessed Holy Week and a Joyous Easter to eeryone! I’ve been playing and promoting this among friends for a couple of years now, but this year was the best so far!! It has been really fun to watch this grow and thrive. I voted for Emma – I will be using her in VBS in NavajoLand this summer, so I’m hoping to add this win to her story!! My rector very much admires DB (a frequent topic in sermons) and it was fascinating to weigh him against so many other inspiring people. Thus I must go with Emma, truly an inspiring woman and the only one to best DB. Thanks to all, and a blessed Holy Week. May our high notes, sermon topics and photocopiers rejoice. Hats off to the Supreme Executive Committee (justly named) and the Celebrity Bloggers! At the end of my first Lent Madness, I am grateful for your hard work and your sense of humor. It’s put a whole new spin on Lent for me. Muchas gracias! I second that — this has been an incredible experience and I have learned so much, laughed often and enjoyed being part of this incredible community. Can’t wait till next year! Still I think it was a lot easier to be a saint when one was in close personal contact with the living Jesus. But 1900 years later, one woman, a grieving mother and widow, who saved her people, both body and soul, is to me epitomizing no Cinderella but a true saint. “Blessed are those who have not seen [Jesus] and yet believe.” Jn 20: 29. Many thanks to the SEC and the Celebrity Bloggers. This was my first Lent Madness. And I think it was the first time I have had fun with my Lenten discipline. I learned a lot and am looking forward to Lent next year. I am voting for Mary but really, it doesn’t matter. I sing a song of the saints of God … and I mean to be one too! This has been great! Thanks for the effort and for making it seem so effortless! Well, this is not at all where my bracket ended up, so I have no real stake in this outcome. But I cannot see voting for Emma against such competition as the Magdalen! I have really enjoyed participating in Lent Madness – even learned some things a long the way! Without DB in today’s vote, it was a very easy decision – I have voted for MM all the way, and also DB. I look forward to Lent, 1913 (a first!). Ann, please let us know how time travel works out! Oh, Emma, how I love you, but THE Apsotle to the Apostles get my full backing in this vote. Go Mary Magdelene, the original Bad Girl of The Bible! Surely the original Bad Girl is Rahab… or Eve? “I have seen the Lord.” It still all boils down to that one line…..five simple words that sum it all up for me. The Magdala is the one Jesus chose to make know His glorious victory over sin and death. Amen. I’ll truly miss LENT MADNESS and reading all the sincere and zany, and even the ????? ones from some interesting folk. The Padres Schenck and Gunn and guest writers are all to be commended for bringing some real joy and knowledge into my life for these few weeks. I still don’t know where I was during the first two years. Oh yes, my offer to come to Nashville still stands as folk here still don’t understand what I even meant by LENT MADNESS…Hellbent on UT and KY, I reckon….Bye, y’all…..alla y’all !!!!! I echo the thanks of many to the SEC and the CB’s, all of whom have done a fantastic job. But, I am with Ann on this final vote. Without DB in the “championship” round, the Lady from Magdala must prevail. (In a way, I have to admit I am relieved; had DB still been in the running, I am not sure how I would have voted!) And now, I simply pray that all of us have had/will continue to have a(n appropriately) troubling Holy Week and a blessed Easter. As the first witness to the Resurrection in 3 of the Gospels (Mark, Matthew, and John, pace Wikipedia), I believe that Mary of Magdala deserves to be First Among Lent Madness Holy Persons. I think the phrase “She knew the Guy” was my favorite! Thank you all for taking the time to do this and for letting us all be included. A contemplative Holy Week to you all. And the rest of us don’t know the Guy? This is sooOOOooo difficult, but I think I’m going to have to go with the first evangelist. Loved loved LOVED Lent Madness! I voted for Mary, but after reading the comments was kinda wishing I had voted for Emma. Either way, I was so grateful to learn about Emma, and Enmegahbow and so many others that I didn’t know about. Thank you SEC and the bloggers, as well as the other participants who posted so many interesting perspectives! Who knew that the Diocese of Hawaii was the Cook County of Church Politics- When asked “How many votes do you have? Those suntanned wretches of such beautiful islands, respond: “How many do you need!” So I shall be “Maudlin” in honor of Mary M.
I though just had a very good GOTv strategy… I thought Scott took care of the Cook County or other ballot stuffing activities. Queen Emma founded St. Andrew’s Priory – an Episcopal girls school in Honolulu. The girls and faculty deeply admire Emma, and it is no wonder that there are large lots of votes being cast in her favor which all stem from one location. It doesn’t necessarily mean that there is ballot stuffing. Your comment, the first part of which I’m sure you meant in jest, does not take into account how much she is loved by our community. Her legacy is everywhere apparent here. Nevertheless, both women are tremendously amazing, and both are deserving of winning. Certainly no offense was intended. I know Emma is beloved, and I can see why. She’s amazing (and so is Mary Magdalene, of course). For what it’s worth, I find the deep devotion to Emma and all that she represents to be inspiring. One day in the not too distant future, I hope I can see Emma’s legacy in Hawaii firsthand. Anyway, you all should be proud Emma made it to the championship of Lent Madness, another honor for her. Lots of people didn’t think she would do it, and yet she has shown us all. In doing that, she has honored us. Or, more to the point, Christ’s light in her shines on us all. Goldtone Halos to all who contributed to Lent Madness. LM introduced me to Evelyn Underhill AND Episcopal Priest Barbie. I loved it and learned from it and laughed at it and even got verklempft amidst this cloud of saintly and earthly witnesses. All this, and lovely parting gifts, too–many new books to read and ideas to ponder. Thank you and bless you, every one. Thank you for giving me a fun yet educational Lenten experience. I am already looking forward to next year’s offerings. I too am torn between MM and Emma. My Mom died on Saturday and we will celebrate her life on Maundy Thursday. I believe that she too has now seen the Lord yet one of her favorite vacations was when we celebrated my parents 50th wedding anniversary in Hawaii. What would Mom do? So sorry for your loss. May God bless you & your family and, also, comfort you with good friends & memories. I join Ginny in praying blessing on all your family, Marty. And what a delicious question to ponder–“what would Mom do?”–as you remember her life with love and joy as well as grief! I cannot recall how I stumbled upon LM, but I have learned so much. Thank you SEC, the celeb bloggers and those who commented. For today’s vote, Emma has captured my heart. Despite dealing with her own grief, she helped save her people by way of improved healthcare and education. She put into action the lessons of our Lord. Like DB, she was on the front lines. MM gets my vote although ANY of the 32 deserves to be here in the final 2. Tennebrae service last night–and the Light of the World who could not be extinguished brings me to Mary Mag and her faith and belief that could not be extinguished either. My heart breaks for her as I picture her crying in the garden, and then her joy in seeing the risen Jesus! Without her witness, would any of the others have been strong contenders? Got to go with the First Lady of Apostles! As others before me have said–thanks for this fun, imaginative and informative look at Lent. My faith has been deepened and my walk has been made steadier. Bowing both to the inevitable Pacific bump and to Emma’s devotion & faith, I cast my vote westward. All honor to Emma! What a wonderful journey this has been. The celebrity bloggers were fantastic and I so enjoyed learning about heretofore unheard of saints. What an inspiration Queen Emma has been! However, my conscience dictates I vote for Mary Mags, the first Apostle, so with much respect and deep love for Queen Emma, I must vote for MM. Either way it’s win-win. Happy to see a woman winning this year! What do you think, everybody? Jesus doesn’t trust us all? I think she was first because she got up earliest! In historical context? My guess he trusted Mary Magadalene more than the guys! Should…or should have? In context, trusting Mary Magdalene more than the other disciples would make sense — to me. FWIW, I was raised Jewish and often characterize myself as a 1st century Jew stuck with 21st century Christianity! Reply stream didn’t make it clear that I was replying to Bob’s question above (hence the odd grammar) – sorry. Doesn’t Jesus trust us all? Do you think he should? I say Nope, (“Ah, Holy Jesus… I crucified thee!”) but luckily I’m not in charge. Love is. Bob, Bob,Bob……Land O’ Goshen, will you please relax? you’ll live longer, add more years to your life/life to your years, reduce your risk of migraines, acid reflux, nervous twitches and the sudden impulse to run screaming up and down. Go get yer feet washed and have a blessed easter. I am torn. Mary M. is my favorite saint and I agree with everything that has been said. However, Mary like many of the figures in the NT is just at the point where historicity fades into mythos. Emma is a modern person who is an example of sustained prayer, faith and action…an incarnational faith. I must read and pray. Vote against Mary Magdalene during Holy Week? Well, _I_ did, but I don’t think Emma has much of a chance this time. Oh Tom, I taught you well! 😉 I suggest a tie! I am curious — has anyone in Hawaii been voting for anyone other than Queen Emma? If you’re afraid of episcopal retaliation for admitting it, never fear — you can all come live with me, in peace and safety (I’m going to suppose there aren’t many of you). You may have to wait for the airport to reopen before you fly in, though – we’re expecting 25 cm of snow later this afternoon. MM all the way! I am not convinced it was easier for her to be faithful than more modern saints. Those first followers did not have an easy road. And there were plenty in close proxity to Jesus who did not have faith–like, just about everyone in our Holy Week readings. Blessings, Marty, to you and your family as you grieve your Mom. Maundy Thursday is a beautiful day for a service of remembrance. God grant her rest, and let light perpetual shine upon her. I love Mary – she is one of my great heroes and inspirations. I owe my life in part to the good people of Hawaii – Emma will always have my vote! Many thanks to the SEC and the contributing bloggers!! Thankfully, all of the exemplary followers of our Lord, Jesus, the truly RISEN ONE, are presently enjoying the immeasurable Presence of and Communion with GOD in Heaven! Each of the Saints that were studied, examined, contemplated, and “vetted” are worthy of our gratitude because each one of them, in splendid variety, showed us ways to travel to Jesus as well. This was fun and exciting. 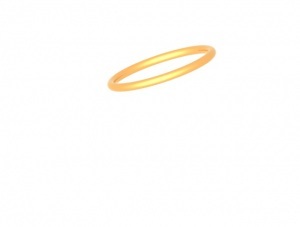 I say a golden halo for ALL of the Saints!!!! Oh, I know that Mary of Magdala will take this, hands down. We’ll be with her early in the morning, bleary eyed and maybe even crying on Sunday. But it’s snowing here in Pullman. Someone has to remind me of the sun! Besides that, my granddaughter’s people are from Tonga, and her parents take the family to Hawaii whenever they can get there. Aloha. Many thanks for a simply outstanding experience during Lent. You guys are awesome! One final impassioned plea for Mary Magdalene. There are many excellent reasons to vote for Queen Emma. Both of these women deserve to be celebrated for their witness…but Magdalene has waited so much longer. Mary did indeed have the blessing of walking the earth with Jesus, hearing his words first hand, supporting his ministry. She was less blessed to see it all fall to pieces — starting “today” — in the worst possible way. All she could do was stand and watch — yes, and weep — as this wonderful man, who said and did such amazing things, was humiliated and tortured to death before her eyes. She had to wait until the powers that be had finished with him before trying to restore what honour she could to his remains, in accordance with their tradition. She was denied even that. His dead body was gone. And then she met the Risen Christ. She met him because she was out there doing what she could to honour him, not hiding behind closed doors, even when all seemed lost and hopeless. She was the first to have a personal encounter with the Risen Christ, and the first to share the astonishing news with the rest of the disciples. And yet somehow, tradition forgot that the first evangelist was a woman. Tradition made her other things — Jesus’ main squeeze, a redhead (understood by medievals to be the hair colour of a prostitute), officially a woman of ill repute (thanks for that, Greg). Conveniently forgetting the ‘apostola apostolorum’, for thousands of years (and yet today, in some traditions) women have been denied the opportunity to preach, teach, and celebrate their Lord…to tell the Story first told to the rest of the world by a woman. He is Risen! Magdalene knew it intimately. She knew it first, and she knew it first because she was out there with never-say-die faith and loyalty trying to find and honour her Lord. She told his Story so we can find Him, too. She deserves that Golden Halo. Jennifer, I was wavering, but you convinced me. Thanks. THANK YOU for the gift of Lent Madness!! Tim and Scott you both deserve a break, but what about a Pentecost competition? If not, perhaps a LM Withdrawal Survival Guide? Mary Magdalene was, of course, a worthy woman. She was chosen to be the witness and chosen to be the companion. Regardless of the misinformation created by jealous followers, her reputation is finally being cleared and her importance is being acknowledged. Queen Emma lived her life AS THOUGH she had been chosen, and her good works were done on Earth, without reward and often without the recognition of the effort she made to make all of her people safe, well and valued. She suffered personal losses that few of us could even imagine, and yet she continued to try to pass on the gifts given to her by God. Magdelene has already been given her halo. Emma has not, and–all the more reason to support her–she wouldn’t ask for one. There is no further comment. LETS GO MARY LETS GO! Yes Emma is very important but c’mon Mary Magdalene actually SAW an angel. Yes believing is better than seeing but this is too far. Mary will win. She is OBVIOUSLY the one who deserves the GOLDEN HALO!!! Mary! Mary! Mary!!!! LET’S GO MARY LETS GO!!! Yes, it is still Lent, but ALELULLIA! for All the Saints, anyway, all the time ! Leilani…there’s actually a BOOK? pleaase advise where I can acquire said book(I’m one of those maniacs who actually believe you can’t have too many books.you should see my collection.). I must walk away! I keep hitting “Refresh” to see how the voting is going. People say, “DUUUH she followed Jesus because she met him in person”. But it must have been so much more difficult to follow a Jesus who was actually there. They/We couldn’t impose our own ideology on a Jesus who could turn around and say, “Get behind me Satan”. They/We couldn’t say, “You have to understand him THIS way because if you try to follow His actual words it’ll be way too difficult”, because He could turn around and say exactly what he meant. The day after the feeding of the five thousand Jesus seems to have been back to feeding twelve (plus women?) again. Following the real, genuine, living, breathing, preaching Jesus was difficult as! Mary Magdalene followed Him all the way. Maybe someone ought to start a fundraiser by taking wagers on what tine Emma will overtake MM. I couldn’t sleep last (started reading a Bonhoeffer bio) … At 3 am eastern it seemed to me he was still leading. I am gladly voting for Mary Magdalene while admiring Emma. Not sure what good that will do. Have you all noticed that when Emma is on the ballot another 1,000 voters show up at the polls? Thanks to the SEC and the celebrity bloggers! It has been a wonderful experience! Mary Mag has been my choice and my hope right from the start–the rest were wonderfully interesting (thanks, Scott, Tim, Penny, Neil, and all the rest of the CBs), but she’s the First Apostle, long ignored! I’d have been a little more conflicted if one of the Celts had made it past the Saintly Sixteen and on into the finals, but this was really no contest as MM progressed down the bracket. What fun this has all been! I’ve never spent so much time in front of my computer with such delight and benefit. Thanks again to all concerned (which includes all those who posted comments)–looking forward to next Lent already! Thank you Lent Madness for making this Lenten season so enjoyable! No matter who earns this Golden Halo, you have shared the legacy of our beloved Queen Emma, who did so much for the people of Hawai’i. I certainly learned a lot about the other Saints in a most entertaining manner! Looking forward to next year! My vote for the Golden Halo goes to Emma of Hawaii. She really is the Cinderella in LentMadness! Anyone who can go up against Catherine of Siena, the Apostle Paul, Thomas Cranmer, and finally Dietrich Bonhoeffer and win all the way, deserves my vote and many more! One may even argue, Mary Magdalene had a weaker field (seeds) on her way to the Golden Halo round. You made a believer out of me Your Majesty! And thanks, LentMadness for introducing us to all these wonderful saints during Lent! It has been fun! May all now have a powerful witness to the God of Love this Paschal Triduum (last three days of Jesus’ life). Your efforts made me smile,laugh aloud,learn,contemplate,appreciate all the time spent by you two,admire the lives of the saints,and rejoice Despite all the distractions of this time of year (like Baylor beating Notre Dame for Womens NCAA—-which,come to think of it,is another battle of the saints).May I wish you a bkessed Holy Week? For me it’s a no brainer, the Apostle to the Apostles gets my vote. Without her, we might not know anything about the resurrection, because the guys were not talking. They were hiding. I voted Mary Magdalen and Dietrich Bonhoeffer (who is probably my favorite “saint”) all the way and would never have believed that Queen Emma could have made it to the Championship. But my vote has changed and despite the obvious fact that Mary Magdalen experienced the VERY FIRST Easter – her own personal first Easter according to John – I am going with Queen Emma. And here’s why, it is clear that there is a faithful Church community that owes its existence to her and her husband. As this is an Episcopal event, I am not opposed to giving Emma the nod as the great “Episcopal/Anglican” saint of the tournament. It is clear that her witness lives on into this day in a very tangible way – although I know that the whole body of believers might be credited to Mary on some level : – ) Still, it is the much-maligned Pacific Bump which has convinced me that the “arc of history bends toward” Emma! Go Queen Emma-lani! And thank you, everyone involved, for an AMAZING Lenten practice! In solidarity with my lifetime home of Hawaii, I must vote Emma. Thank you to all who put this wonderful project together. It has revolutionized my Lent! Ohhh, such a decision! However, living in Hawaii I have to vote for Queen Emma! Come on, guys, I love Emma, too – but please keep the voting fair! It just makes me want to vote for the wrong reasons! This one is really, really hard. While I’m still thinking and praying on this one, let me make a few comments about this whole process. While I’m still thinking and praying on this one, let me make a few comments about the whole process of Lenten Madness. Thanks so much, Tim and Scott as well as all the celebrity bloggers, who created an original fun and educational Lenten “discipline,” however undisciplined it may have seemed at times. And particular thanks to the hundreds of people who left comments. I have read them all and with exceptions that could be counted on one hand, they have been uniformly thoughtful, witty, spiritual, educational, fun, and (dare I say it?) Christian in the very best sense of the word. It has been a notable contrasts to many church blogs, many of which are filled with hateful, snarky, mean, and nasty comments. And particular thanks to the hundreds of people who left comments. I have read them all and with exceptions that could be counted on one hand, they have been uniformly thoughtful, witty, spiritual, educational, fun, and (dare I say it?) Christian in the very best sense of the word. It has been a notable contrast to many church blogs, many of which are filled with hateful, snarky, mean, and nasty comments. Thanks for making this an exemplar of The Episcopal Church at its best — the ability to disagree, even passionately, in a loving and humerous kind of way. Major, major Lenten Madness Withdrawal after Easter! The Lenten Madness obviously infected my computer. Don’t know what caused the dupblication. Sorry about that. he died — when he died…. And here comes Emma, staging her usual comeback….. When I became involved with Lent Madness it was because the parish is using it as a fundraiser and not because I had any real interest in it. We all entered a bracket, put up some money and the winner will designate an Episcopal charity to give the money to. However through the process my feelings changed. I am a retired police officer who left with a line of duty injury after 27 years of service. Prior to that I was a Methodist minister, yes there are a few seminary trained cops out there. I approached Lent Madness using the same tactics that I know so well. I investigated all of the saints, using multiple sources, and attempted to draw for myself a picture of their life. I discovered that generally speaking most of the saints generally lived saintly lives. I also discovered that generally speaking most at times were decidedly unsaintly although all in all good folks trying to follow God’s way. I also realize that probably describes most all of us. That is a humbling thought and a reminder that I still have a lot of work to do with my own life. I have posted frequently and I know that at times I have offended some of you, that was never my intent. I am either blessed or cursed with a dry sense of humor that can easily be misunderstood. I have read most all of the posts and have found them to be funny, informative and rarely mean spirited. I have been an Episcopalian since 1998 and can best be described as ambivalent toward the denomination. It has been my experience that limiting your activities to regular worship services works out fine but the deeper my involvement the greater my disappointment. Lent Madness has been an exception as I have learned and enjoyed throughout this experience. Thank you Scott and Tim and to the whole Lent Madness family for this opportunity. My prayer for all of you is to have a joyos and blessed Easter season. Jim – a great summary of the Lent Madness experience! Smiling at the idea of saints as subjects of forensic investigation. A blessed holy week and joyous Easter to you, too! Best Lent ever! Dare I say I’m actually looking forward to next Lent? Though Mary Magdalene is perhaps my own favorite saint, for the reasons others have stated so well and because, growing up as little gay boy in a Pentecostal church, the witness and experience of Mary Magdalene helped me see that God loves everyone, still, I voted for Emma. I knew of her before Lent Madness, but I learned much more about her here. She inspired me this Lent in a way I needed. So, another time, it would have been the Magdalene, but today it’s Emma. I’d really like to thank all those involved in Lent Madness, including everyone who took the time to post comments. I read the comments every day and enjoyed them–and learned from them! The flood of conversation reminds me that as BIG as this world and all its problems are, we are truly the Body of Christ. I see the names of folks I grew up with alongside utter strangers. Strangers? But you speak my heart and fill my soul. One. Ohana. The Body in all its diversity, passion and joy. I love it. And when the Golden Halo is announced I will be simultaneously full of joy and sorrow. How can only one of these precious women win? Frankly, I think the Golden Halo should be shared! So glad to get to vote one more time for Mary Magdalen, this time for the Golden Halo. What a grand trip this has been! Thank you Tim and Scott, Celebrity Bloggers, and everyone who voted and chatted and lobbied and shared your reasons for voting, whether personal, scholarly, or spiritual. I’ve enjoyed learning more about saints of the early and medieval church, and about Anglican saints I’d never heard of. Thanks for letting this Catholic play along! I vote for a tie! I wrote this song a few weeks ago; it certainly reflects my feelings right now. I love this Lent Madness! I can’t stop checking the score. Stop voting more than once! Beautiful – okay, it’s Madness! And now I’m praying so hard. How could you vote for that saint? And pray for Mary M, oh pray for Mary M! Sinking in maddening Lent Madness. You insane people of God. And when I say “insane,” of course I mean insane with love of Jesus and the Saints! Thanks for an awesome Lent Madness! PS – I have also loved the art. THANK you. Over the years our Lenten Sunday’s in Boothbay Harbor have been purposefully awkward and reflective as the chairs in the sanctuary are set monastically. This year I’ve been smiling across to this facing congregation thinking one or more over there, may be a secret Lent Madness blogger. Thanks for one of the best Lents ever. We are at Disneyland today and reminded our mom when we got back to the hotel that we needed to cast our final vote. We just want everyone to know that LM has been super fun. We learned a lot about some incredible people. Our favorite saint is St. Nicholas who lost to the tea lady. We also thought Enmegabowah was interesting and was married to a real go getter who had the cool nickname of the Iron Sky Woman. And we have loved the saints who were cave dwellers. But now it is down to two women named Mary and Emma. We think both of these people are wonderful — they are both winners in our opinion. It is very cool that two powerful women are in the final round. As for who should wear the golden halo, we voted for Mary because of her close connections with Jesus. We hope Emma gets a halo too — maybe a halo made of the fragrant flowers used in leis? Hawaiians, it is now the appropriate time for you to show your support of our blessed Queen Emma, by calling friends and neighbors to encourage their voting, one vote per person, to assist in the halo being placed on our Queen’s head. Mahalo! I voted for Queen Emma because I see her legacy every day (I live in Hawaii). We love her because she cared enough about her people to help meet the spiritual and physical needs of others besides herself. Her work, her love, her testament continues to this day. This is a technical question. Do votes from the same wireless location get counted as votes by the same person, or does it register by individual computer? Is it possible that the 120 votes were from people voting from the same place? Such as the girls who go to the St. Andrew’s Priory School–which is on wireless, even though the girls have different computers. I have been pondering the 120 votes from the same location also. Could it be the girls at the Priory School expressing their devotion and thanks to their founder? Each student is required to have her own computer operating on a wireless system. Many girls from all walks of life are able to attend this wonderful school thanks to the scholarships provided by their dear Queen. Another example of the faith and love of Queen living still today. Emma continues to live today through her example of Love Begets Love. Or maybe the votes were by someone trying to discredit Queen Emma. The good news is that there’s a system in place to Catch it and keep it fair. Aloha from Kauai! My husband and I have the great joy of being here with the good people of the Episcopal Church on West Kauai for a few months. Queen Emma is getting votes because she is true saint to the people of Hawaii. It is wonderful that this very witty and fun event is making her known more widely. (We are 6 hours earlier than on the east coast so don’t count her out as some late night Emma lovers in Hawaii may yet vote!) Thanks so much to those who put this together. It has been fun and informative. If you are still up, vote for Emma! Wow! What a fantastic trip this has all been. I’ve learned so much and had a lot of fun. And I’ve also enjoyed discussing the contest with my Facebook friends and coworkers — even convincing my atheist supervisor to cast a vote or two! Alas, the brackets didn’t turn out as I had expected, but that’s hardly the point. Thanks so much for all the great work put into this by the moderators and “celebrity” bloggers. You all make me proud to be an Episcopalian. Unfortunately, I think my Hawaiian brothers, sisters, daughters, and sons are still sleeping. Who would have ever thought that little Emma of Hawai’i would have had her good works made known to so many. That, in its self, is almost a miracle. This daily devotion has brought so many closer to Our Lord, His Blessed Mother, and all the company of Heaven. Thank you to all involved in this Lent Madness. It has been a wonderful ride. He Is Risen, He Is Risen, Indeed! GO MM!! thank you all for Lent madness, I’m missing it already. What a strange and fascinating exercise—the tendency toward vaudevilian humor not withstanding. And now we strip our altars tonite and our Lord is gone—-gone so Mary can once more mistake him for the gardner. So how would someone vote 120 times? Is that your cookie was not saved? It seems like a miracle that you could vote so many times for the un-saint queen. 1 Trackback to "For the Golden Halo: Mary Magdalene vs. Emma of Hawaii"